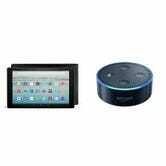 If you want a tablet to basically use as a portable TV (that’s basically what my iPad is at this point), a big screen is important, and you’d be hard pressed to find a better deal right now than an Alexa-enabled Fire HD 10 for $150, plus a free Echo Dot. It’s not as fast as an iPad, it doesn’t have as many apps as a standard Android tablet, but its 1920 x 1200 IPS display is ideal for binging Westworld while you cook dinner. $150 is its regular price, but the free Echo Dot is a really nice toss-in.